Robert Swan, OBE is the first person to walk to both the North and South Poles. Since 2003, he has led annual expeditions to Antarctica with students and business executives to focus on leadership training, environmental clean-up and education initiatives. Ecozine editor Esther Wong was one of the 2013 ‘Inspire Antarctica Expedition’ team members, and spoke with Robert on his recent visit to Hong Kong. Ecozine: For those who are unfamiliar with your work, how did you get started? Robert Swan: Many years ago, I walked the North and South Pole and became the first person to do that. On those journeys, we touched upon a few things that people are now realizing: we walked under a hole in the ozone layer – my eyes got burned out; our faces burned away. When we went to the North Pole, the ice cap melted beneath our feet and we nearly drowned. We touched some of these issues about climate change and global warming, and I thought that I must be positive and I must inspire young people. I looked ahead a bit and thought that one thing we might be able to do is preserve Antarctica, so I formed “2041”. Ecozine: As founder of the organization 2041, could you tell us why you chose this name and why that year is so significant? Robert: 2041 is the year the treaty that protects Antarctica from development and exploitation comes to an end. We should have the sense to leave one place on Earth alone, and with 2041, we’ve been able to do fantastic projects, all to do with inspiring young people – not just talking about saving the planet, but to work with industry and actually do something about it. Ecozine: What have been some of the challenges of running the 2041 organization? Robert: We’re a very small team of people, so it’s a lot of hard work. Also, raising money for our cause and to send young people to go to Antarctica with me has been difficult, since we’ve been in a recession. That’s the main challenge: making sure that we still fill the ship and have people going to Antarctica. It requires people raising money; it requires me raising money. It’s hard in a recession, but we’ve fought on. Ecozine: 2041 has also been very successful – please share some examples. Robert: I like to join together corporate people and young people: throw away the mobile phones and the communications, and then they can really get to know each other. It gives everyone a chance to find out what corporates are really thinking, and what young people are thinking, and I think it really changes the mindset of both the corporates and young people to be together on our ship in Antarctica. It’s good to see them working together, coming out with friendships and joint solutions. I’m really proud of the expeditions, actually. It’s a huge effort to get all those people on board – on your expedition there were 80 people from 28 different nations, and I’m the person that found them all. I had to go around the world and find them. When you come back and see how people can change their lives, it's fantastic. In India, people have set up education bases. It’s unbelievable what people have done. What’s really very important to me is that people haven’t gone off and said, “Oh, we need to go hug a tree and save the planet.” You see great examples of what people have accomplished, and I’m very proud of that. And I’m most proud when people share their things with each other, that’s what makes me feel very strong – that we are making a difference. Ecozine: You spend your life traveling as an advocate for sustainability. How do you counteract the environmental effects from that? Robert: I do two things: one is to make sure we (as a company) offset our trip to the Antarctic. Each person that goes to Antarctica costs 10 tons of CO2, the carbon equivalent to 10 families in India for a year. We do that as a company by buying carbon offset. I offset my flight personally by planting one tree for a short flight, and two trees for a long flight. I have a little forest being built in Mexico. When I’ve finished traveling, there will be a whole forest. The second thing I do is to inspire people to participate in carbon offsetting programs themselves. Ecozine: What projects do you have lined up next? 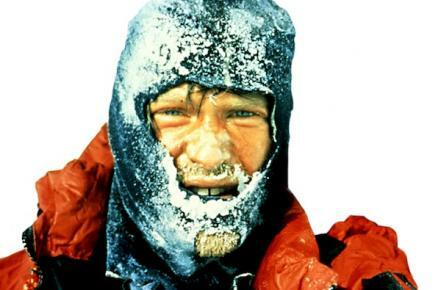 Robert: When I put my first expedition together, there were no mobile phones, no laptops, no Internet, nothing. We just had electric typewriters, a normal telephone, and photocopiers. Things have really changed since then. What I’m really excited about is the way my team is using new social medias to keep connected. I’m not one of those people who don’t understand Facebook, YouTube, Twitter, no: I’ve embraced those things and it’s fantastic to see how it’s all being used to engage people around the world. In three years’ time, I’m planning on making my last great expedition in the Antarctic, returning to the South Pole on a 1600km journey, but only surviving on renewable energy. We will continue to take people to Antarctica, and we will continue to open small education bases (e-bases) around the world, especially where our alumni group want to help us do it, so we’re going to move it ahead.